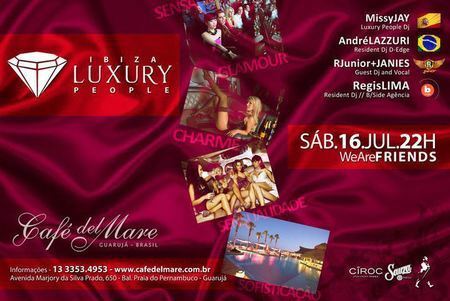 DJ Missy Jay is a regular at Ibiza luxury events and the CEO of Ibiza Luxury People has personally invited Missy Jay to play at Café del Mar Guaruja in Sao Paulo, Brazil on Jul 16th. "Brazil is such a beautiful country full of super fun people," said Missy Jay. "I am really looking forward to being there. I am glad that my music is boundless and I am able to travel far away to let my fans dance and have fun. Ibiza has been, and still is, a great showcase for me. It is through Ibiza connections like Ibiza Luxury People CEO David, that I can expand my music to South America. I continue to be blessed with these opportunities that arise for me." Café del Mar opened in 1980 as a meeting place for locals and as a source of inspiration for authors and artists and by the 1990s, had become one of Ibiza's most iconic locations. The establishment quickly gained renown for its annual release of chill-out compilation albums. Licensed franchises of the club are now located in 11 locations around the world. The world-famous DJ has played for the organization in Ibiza at several clubs and at the El Divino Closing Party. Ibiza Luxury People was created to answer the need for combining audio-visual entertainment, the arts and house music into a single extreme of refinement and elegance. A legendary party relies on more than atmosphere and décor. The right music is essential and Ibiza Luxury People are ambassadors of Balearic and Ibiza sound. The organization features legendary DJs to emerging talents at its events. The award-winning Missy Jay is a veteran of many Ibiza Luxury shows around the world and is a perennial favorite with her high-energy performances. Missy Jay's performance at the Café del Mar Guaruja in Sao Paulo on July 16 is an opportunity to experience the music of one of the top DJs in the world as she works her dance magic on party-goers. Her innate talent and intuitiveness has made her a favorite at lavish luxury events around the globe.